Are they splicing tape at Front Sight? Are they converting analog to digital? Are they using Final Cut 0.2? 😂 I’m actually deceased every time I see one of these videos. I just assume the owner Ignatius Pizza has been repeatedly securing hella bags 💰 since the jump (pure speculation judging by all the google ads I used to see) so naturally I’d expect the promo content to reflect that. It does not. 2:39 – These ladies give the date of the robbery (Feb 22) and holy… ok the video is confirmed 2018. WILD. I feel like I’m in the matrix. Yo did any of you guys watch that German thriller “DARK” on netflix? I feel like if I crawled through the tunnel in the cave I’d end up in the past at Front Sight. Speaking of which, If I ever attend a halloween party that has gun bros at it, I definitely should rock the front sight fit. Tan colored head to toe, with the black belt, OWB 1911, black and white surname patch / company name on the pecs… flag with the black border on the right arm. Why Does All Front Sight Marketing Look Like It Was Done In 1985? Seriously, I don’t get it… Literally all the videos look like they were filmed back in the 80s to fill time from 3AM to 6AM on a local cable TV station. Front Sight used to do a LOT of online advertising. Because of that I just assumed they were caked up like Scrooge Mc Duck, just swimming in cash over there. I literally could not escape their ads, or Ignatius Pizza and his epic push broom. 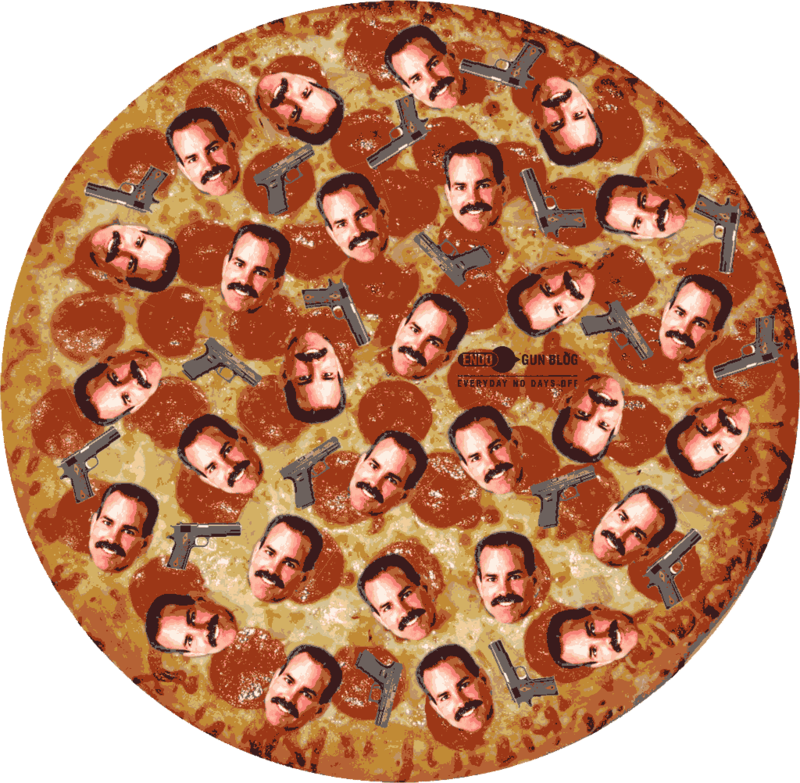 I know I crack my self TF up, but seriously that Ignatius Pizza photoshop I did is still one of my favorites. I hope at least one person at Front Sight trolls him by having that printed out and pinned to the fabric wall of their cubicle. Maybe they even call him “Pizza” as an endearing nickname? Or “Slice”… damn that’s actually kind of badass. If my surname was Piazza I definitely would want to be referred to as “Slice”. I’ll admit after I saw the autofill suggestion I was like “Oh yea I wonder what his wife looks like”, thinking I would be dazzled by some younger lady that looks like Jem from Jem and the Holograms… sadly Google didn’t deliver any pictures at all. Thoughts? Sorry posting has been very infrequent lately. Life has been hectic you know? Things are great though. Nice of some of you guys to check up on me, thank you. Remember, if you’re fiend’in for some ENDO content you can always hop over to my instagram page. I find for tiny shitposts that’s a lot easier to handle a couple times a day when I’m really busy. This guy basically jacked a funny Front Sight video and use it in his. You can skip past his nonsense to 1:24. 0:48 – Shoutout Ignatius Pizza. If they don’t sell a “Ignatius Pizza” in the Front Sight cafe they are doing both themselves and their students a disservice. 1:39 – Cue the guitar riffs and cool guy walkup. This guy molons A LOT of labe. I can tell. 1:54 – Wtf? What’s a Hawk 982? Is that some sort of Kirkland brand Remington 870? 2:02 – Man you could shatter a rail road tie on B-Rad’s jaw. 2:50 – Man this guy is so extra. 4:04 – This video is from 2014, where as you see the no-look-derp-scan was alive and well. 4:28 – Why does he keep talking about how the rounds have great penetration because they went “through the bad guy”… dude your bad guy is 1/4” cardboard, chill. 2010 in Turkey. I thought it was already bad a few seconds in when the bad guy slit that first dude’s throat. It got 100x worse after that though as we see. All very good points brought up in this video, plus it gives me an opportunity to plug my Ignatius Pizza meme since it’s Front Sight haha. Not bad not bad at all. If you click through to see all their videos on YouTube there are actually quite a few new good ones. Sure beats those videos they used to put out which look like they were filmed during prohibition. At 6 minutes long I didn’t find myself looking at my watch more than once either. I’ll stay tuned.. some good thoughts in this video worth considering. For some reason Front Sight seems to be a very polarizing topic always… either guys love it or don’t (whether or not either have even trained there I don’t know ever). Thoughts? Honestly the main reason I posted this is because I’m so proud of the Ignatius Pizza picture I phototoshopped a while back. Cracks me up every time I see it, but really don’t have much opportunity to use it. One of you guys needs to get Ignatius Pizza to sign the Pizza Picture! The fact James Yeager signed the Buck Yeager picture I still consider a blog milestone. Hilarious from now until forever.